A large area of an open field in reclaimed suburb Hulhumale’ was burnt in a blaze on Monday. 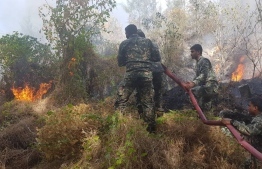 The fire broke out at 1330 hrs in the field, and Maldives National Defense Force (MNDF) took over twelve hours to extinguish the flames. MNDF's spokesperson Captain Azim Ibrahim stated that defence force officers and airport fire teams worked together to put out the blaze. According to Azim, the fire intensified due to litter thrown amongst the trees. “There was trash in the field. It caught fire easily due to the trash and overgrown weeds”. He declared that the fire spread significantly, and the reason for the fire may have been the intense heat. This is one of the largest incidents of a fire in Hulhumale’. Regarding the amount of time taken to put out the fire, Azim remarked that efforts to put out the fire began as soon as possible. “We used water to put out the fire. It was under control”. The Fuel Service Maldives (FSM) petrol shed near the local market was shut down, and several roads leading to the area were closed to the public, but are now open. The smoke from the fire affected some other areas of Hulhumale’. However, no one required medical attention.